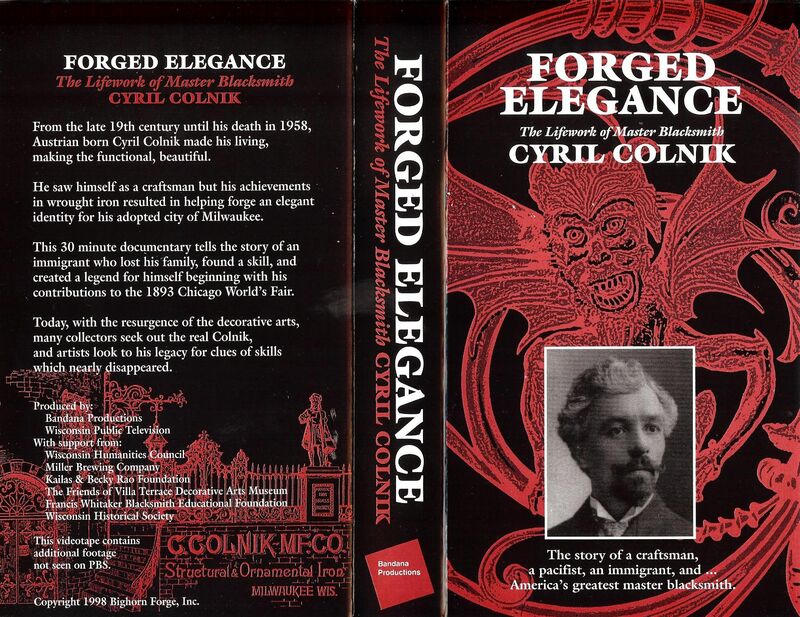 “Forged Elegance, the Lifework of Master Blacksmith Cyril Colnik” (Copyright 1998, Bighorn Forge, Inc.) is a video presentation about the work and life of the famed master blackmsith Cyril Colnik (1871-1958). Cyril Colnik was born in Austria, and came to the United States via the “Chicago Columbian Exposition” (World’s Fair) in 1893. This video was produced through a non-profit venture by “Bighorn Forge, Inc.”, in conjunction with the “Friends of Villa Terrace Decorative Arts Museum”. The video was produced through a grant from the “Wisconsin Humanities Council”, and generous donations from the “Miller Brewing Co.”, the “Kailas and Becky Rao Fondation”, the “Francis Whitaker Blacksmith Educational Foundation”, the “Artist Blacksmiths Association of North America” (ABANA), as well as in-kind services from “Wisconsin Public Television”, and the financial help from several ABANA affiliates, and other private donations. This video presentation originally aired on Wisconsin and Milwaukee Public Television in 1998. Dan Banda, of “Bandana Productions”, was the producer, and scriptwriter for this video. This production was a dream of mine for many years. My intent was to vault Colnik into his rightful place amongst the world’s great masters. As the Project Director, I was blessed to have found a fine and dedicated team of people to put the program together. These folks include Becky Rao, Ruth Cook, and Alan Strekow, who also designed the jacket cover.